the second she's in casual wear, good for the tropics, sitting next to her father, who is center front. He scared me! very strict lines, I had to take his hand and put it to my forehead whenever greeting him, oh my god that white hair and cane, never a smile .. anyway, she's fourth from right, front row, and my grandfather is far right, in front - you can see all his Chinese heritage, he's a Limjoco. The Lejano had more of the Spanish in them. 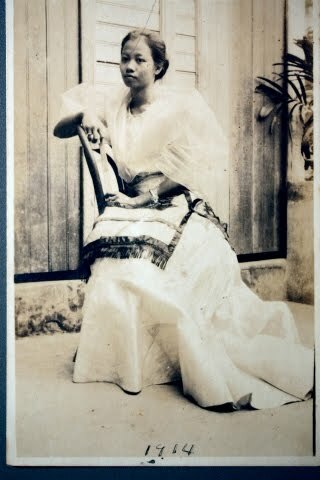 (my great-grandfather, by the way, was addressed by the honorific, "Lolo To`od", accent on the first syllable). 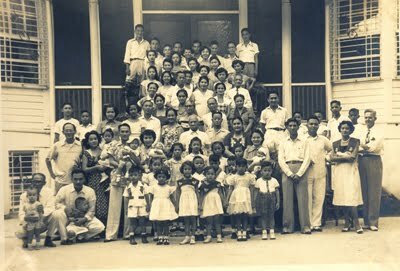 The third is a portrait pic of my mom's family, again Lola in terno ~ and my mom's standing by my grandfather, second from right, sitting in back row. 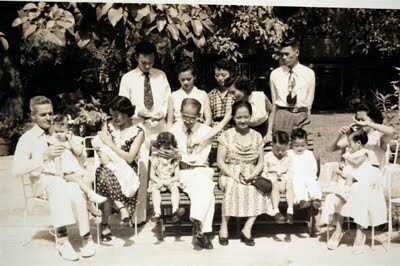 Lastly, a photo taken on the grounds of their compound where we spent our early years (as is the second photo) - Jean's on my dad's lap, left front, I'm by my grandfather who I think is trying to amuse me, he's got his hand over my face. Some of the extended family we grew up with, my grandmother is in front by Lolo, again in that type of informal dress that kept the women cool. They were really grand, sort of an inlaid-mosaic tile .. my mom and dad are on the bottom far right, Jean and I are front center, my grandfather far left in front holding the first boy born after Jean (we had 4 brothers born after us, then a last girl born here in the US), Richard. 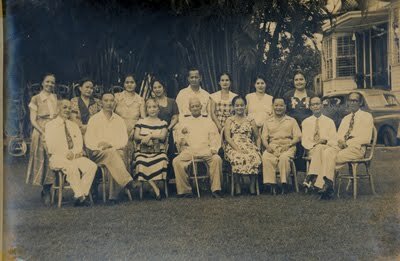 Lolo To`od is of course approximately in the center, with Lola standing beside him, smiling broadly.